Gold Headed Beyond $1300 This Year! "Gold was The Proven Profit Generator over the last 14 years! "In fact, gold's track record is impressive. • From the $258 low in 2001, gold is up almost 500%. 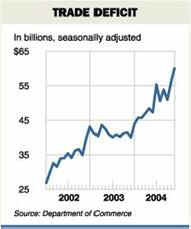 • In 2004 gold prices rose 5.3%. • Gold profits totaled 21.2% in 2003. • Gold generated 24% profits in 2002. Now that we've shown that "Gold is the proven profit generator..." we may surprise you by saying, that more people are likely to acquire gold for financial insurance than for profits. See Latest Gold Coin Prices page for latest gold and gold coin prices. It didn't take long for oil prices to kick back up to six week highs over $48, raising new fears of a coming wave of inflation. From the Washington Post to Time magazine the question, "Is Inflation Back?" is being asked. We already see 4% to 6% inflation last year driven by rising energy prices and skyrocketing raw material costs. Inflation is, "An increase in the amount of currency in circulation, resulting in a relatively sharp and sudden fall in its value and rise in prices: it may be caused by an increase in the volume of paper money issued..."
That means that stuff cost us more today because the Federal reserve has been running the printing presses day and night printing fiat paper money. In fact, they have literally flooded the world with paper dollars since 9/11. To keep U.S. consumers borrowing and spending, the Federal Reserve even lowered interest rates to 40-year lows. Market intervention is risky, yet the Federal Reserve continues to support the stock market bubble and has now created a huge housing bubble. Real estate prices and home building materials are overpriced and poised to go ownhill as the Federal Reserve raises interest rates. As always, manipulations of the economy will overcorrect. As this Austin Report continues, we'll explain how you can avoid losing money in the correction and actually generate substantial profits if you own the right kind of assets in the year to come. In recent months, the Federal Reserve has just started raising interest rates to fight inflation. Unfortunately, winning the inflation battle long-term is something almost impossible to do since 1973. That was when President Nixon first removed the U.S. Dollar from the Gold Standard. In 1973 inflation rates doubled to 6.3% and peaked at 11.0% in 1974 Inflation slowed to 9.1% in 1975. But by 1979, 80, and 81 inflation rates rose to 11.3%, 13.5%, and 10.3% respectively. The 1970's was period of historic importance to anyone thinking about buying gold today. It was a time when inflation was beyond government control and a period where gold prices rose dramatically. • In the period of 1970 to 1975, gold prices soared five-fold. • From 1977 to 1979, gold prices doubled again. • Gold peaked at $850/oz in January of 1981. In the face of rising inflation from 1970 to 1980, the worldwide price of gold increased 1,704%. Today, we're convinced inflation is back with a vengeance! However, it's hard to tell from "official" inflation figures. Back in 1982 the government changed how inflation was measured. Today's CPI index excludes food, energy, and housing inflation. With oil still in the $45 to $50 range, the cost of food, energy, and housing are soaring, but not in the CPI. Let's consider the November CPI that shows inflation at 3.52%. That seems like inflation is up, but still OK. But, the 12-month Energy Index soared 19.2%. Wow, that's inflation at its worse ! This makes us wonder if history is about to repeat itself with rising oil prices creating high inflation and driving the price of gold to all-time highs. Long-term, inflation destroys everything in its path... well, just about everything. Inflation eats away at CD's and bonds. Inflation drags a good economy into recession. Worst of all, corporate profits are eaten away by costs. When corporate profits disappear, down goes the stock market. A few investments, like gold, profit from inflation. Inflation is a bad enough worry, but we've got more bad news. The US trade deficit widened sharply in November to a record $60.3 billion dollars. This put immediate renewed pressure on the ailing dollar and caused economists to scale back economic growth forecasts. Worst of all, the gap between imports and exports grew by almost $10 billion since September. The main culprits were a surge in the volume and cost of imported oil products and a decline in demand for US capital goods. futures. Today we are worried that our consumer mentality is leading us into becoming a "Nation of Debtors. Is America Becoming a Nation of Debtors? Once upon a time, the world bought goods made in America and sent their money to us. The wealth of Americans grew throughout the Industrial Revolution. Businesses flourished. The economy was strong from the end of the Great Depression through the 1980's. Then suddenly things changed. Today, Americans buy far more foreign goods than we sell abroad. We evenimport more food than we export. As a result, we send America's wealth overseas to build factories in China and create jobs in Asia. Wealth is why trade deficits are a big worry . America is becoming a poorer nation while China can't build new million population cities fast enough to house cheap workers. Long-term, Asians will own more and more of the world's wealth. Americans may be left with a massive pile of unpaid bills known as the U.S. National Debt and an unfunded Social Security program. If our debt keeps multiplying, risk that the world may lose faith in U.S. Dollars. We at the Austin Report worry about debt every day. Not our own, but the debt of the Government and the average American family. America is no longer the land of opportunity� we're the land of shoppers, consumers, spenders, borrowers, and people taking out second mortgage loans to pay off their 18% credit card debt. that we must borrow from foreigners. But somewhere, someday, we will all be maxed-out the world will refuse to loan us more money. On that sad day we will truly be a nation of debtors. The problem is already huge as each and every American owes over $25,000. Now, add to that, Social Security's unfunded liability of over $3.7 trillion� and yes, debt is a massive problem. The growing Social Security Debt gets worse as baby boomers retire and there are less workers paying into the system. You and your employer have put hard-earned money into Social Security during your working lifetime. Congress immediately spent every dime of the money and loaned it to pay interest on the National Debt. Watch for Social Security debt to be a hotly debated topic. At best, Congress will put a patch of the massive problem. We're afraid that a structural problem of a magnitude of $3.7 trillion dollars will simply not go away. In a few years, America will have fewer workers paying higher taxes to fund our Social Security and pay interest on the national debt. That guarantees there will be fewer dollars to buy stocks in 401K plans or IRAs. But wait, the baby boomer problem gets worse. Today, the U.S. stock market is dependent on a massive in-flow of new dollars to prop up stock prices. In the future, baby boomers will retire, sell stocks, and create a net out-flow of money from U.S. Stock Market. This is a quietly ignored generational issue facing all stocks in the future. Meanwhile, the government's been on a spending spree. After 9/11 the government budget surplus turned into the biggest debt and deficits problem the world has ever seen. The tax cuts and massive military spending sent the deficit to an unprecedented $600 billion this year. for a total debt of $25,773 per person . The current account trade deficit, the out-of-control national debt, and low interest rates are the primary reasons why the U.S. Dollar is trading near a 9-year-low. That's also why gold moved up to a 16-year-high in December. Looking ahead, we can only see more government spending, the War in Iraq will cost more, and no one in Congress will be willing to raise taxes. Those guys will not stop spending until a worldwide dollar crisis develops. So that that puts the ball in the Federal Reserve's court to pay the debt by devaluating the dollar� yet again. Devaluating the U.S. Dollar let's us pay off debt to foreigners in "inflated" dollars. But, they are not idiots! It's no wonder foreign investors are selling off the dollar, the value's in sharp decline, and why a crisis is unfolding. For Americans, devaluing our currency is a sneaky, hidden tax on wealth. We estimate a 1% decline in the value of the dollar, translates to $100 of decreased purchasing power per household per year. If the dollar were to decline by the 20%, as some see as parity, the average household effective income would fall by about $2,000 per year.
" Every paper currency in history has failed over time, and become utterly worthless." We are all at financial risk today because of politicians and bureaucrats. Money today can be created on a whim by running printing presses� or simply typing numbers into computers at the Federal Reserve. It is this flood of money that may be creating what could become, at any time, the Perfect Financial Storm. As the world is flooded with more and more paper U.S. currency, each one becomes worth less and less. Today, the world has alternatives to the dollar� there's the Euro, the Yen, foreign currency, and always gold. Historically, the ultimate safe haven has been gold. For centuries, gold has held its value. In times when governments abused power, created huge deficits, or debased their paper currency� the price of gold soared. Gold has preserved its buying power while each and every paper currency eventually became worthless. In times like these, fear drives people into gold, but somewhere ahead greed will be in the back seat shouting "Buy, buy, buy!" no alternative to a core holding of gold and precious metals. Today, gold is no longer an optional investment � we are convinced that gold is a "MUST HAVE" opportunity. We continue to feel that gold has a very positive risk-to-reward ratio. In our opinion, gold prices have a long way to go up to hit the all-time high of $850 per ounce� with far less downside risk than many alternatives. A core holding of 10% to 15% of your current assets in gold is often recommended by financial analysts as a way to balance and diversify a portfolio. Buying the right gold that's private and non-reportable is just as important as how much gold you own. When you buy gold, make sure you take possession. Do not accept paper gold certificates, electronic gold accounts, or risky futures contracts. Always buy and hold your gold in your possession in your bank vault. When you're ready to sell, next month or years from now, you want to be able to sell your gold quickly around the world. You are currently on the Gold Information Network website, a division of Austin Rare Coins, Inc. Our companies buy, sell, and trade gold bullion every business day. We are certainly different from pawnshops, jewelry stores, or Johnny-come-lately Internet dealers who won't be around later when you need to sell. For the best prices today on private, non-reportable gold, call us at 1-800-928-6468. We can answer all your questions about gold and would be happy to quote cash and quantity discounts on larger gold orders.